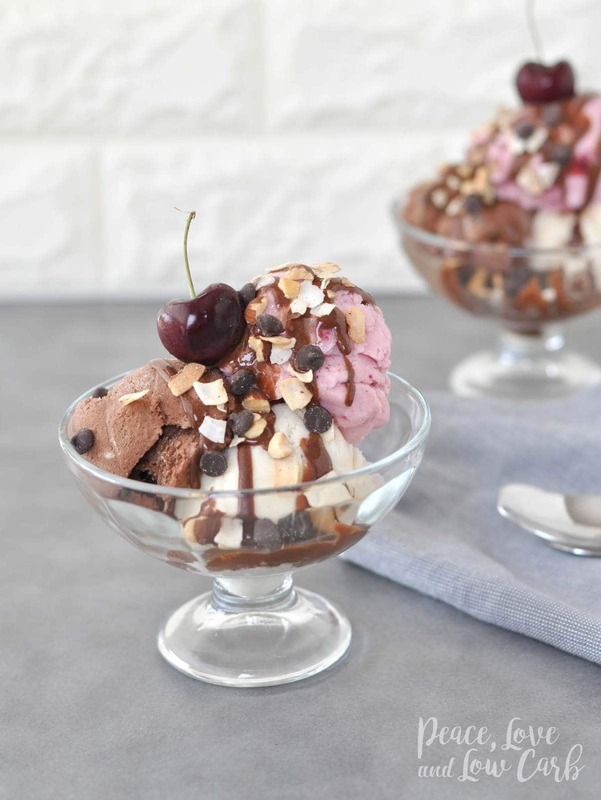 Low Carb Ice Cream sundaes are the perfect summer treat. Especially when there are multiple types of ice creams and toppings! Who doesn’t love a good low carb dessert? Am I right? The problem is that many low carb keto dessert recipes really miss the mark. They either taste nothing like the dessert they are supposed to be replicating, or they are ruined by the aftertaste of sweeteners or the grittiness of nut flours. More often than not, I find myself just skipping dessert altogether instead of settling for a mediocre low carb treat. So when I find a dessert that really satisfies my cravings just like the carb laden version, I get pretty excited. And let’s be honest, we all love ice cream. I scream. You scream. We all scream for low carb ice cream sundaes. When LC Foods sent me all three varieties of their low carb ice creams, I just knew that I wanted to buy an ice cream maker. Although it isn’t required to make them, it gave me just the excuse I needed. I can totally see myself going crazy and making a ton of low carb ice cream recipes. The possibilities are endless. 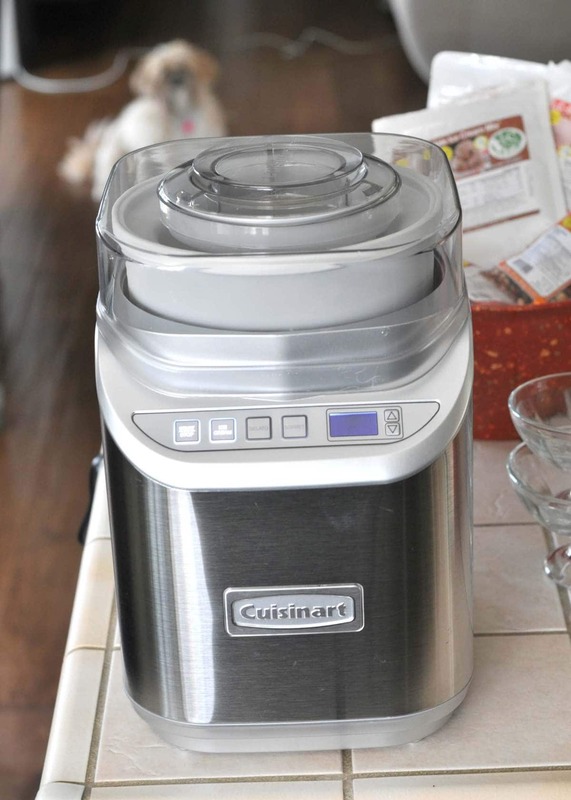 This is the ice creamer maker I got. And of course, just like in all my Instagram photos, Chewy had to find his way into the photo. He is my fluffy little sous chef. For it’s maiden voyage, I made three different types of ice cream: Low Carb Strawberry Ice Cream, Low Carb Chocolate Ice Cream and Low Carb Vanilla Ice Cream. 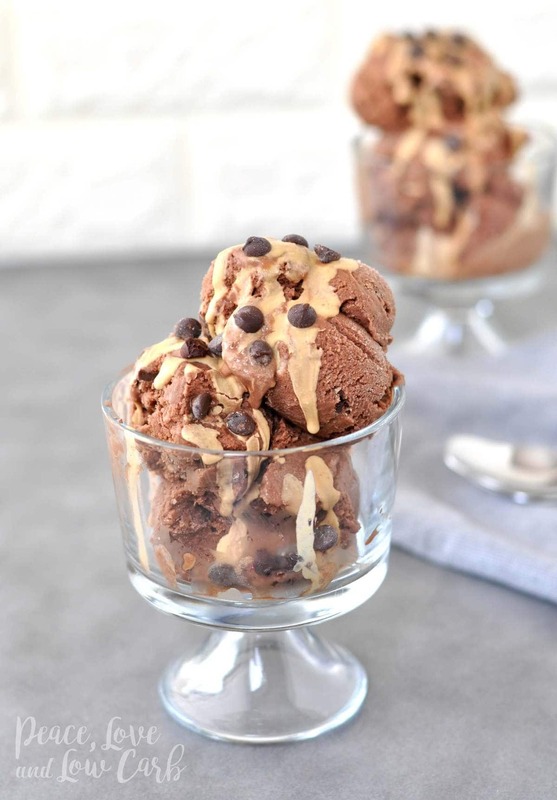 To the chocolate ice cream, I added a low carb chocolate peanut butter chocolate bar. I broke it into pieces and added it into the ice cream and it was finishing churning. To the strawberry ice cream, I added dried raspberries. YUM! I kept the vanilla plain, just as it should be. Then from there, I went to town making low carb ice cream sundaes. I even set a little bowl of chocolate ice cream with low carb chocolate sauce and peanut butter on top aside for myself. Check out the different flavors for yourself. Which is your favorite? 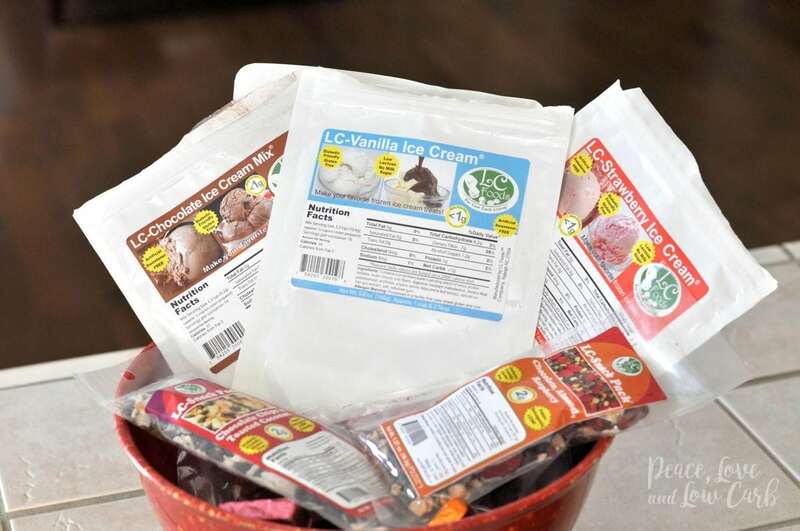 The low carb ice cream mixes are super easy to make. You only need the mix, water, vanilla extract and heavy cream. You don’t even need an ice cream maker, although it does make it easier and I chose to use one. All three flavors come in at less than 1 net carb per half cup. That is considerably lower in carbs than Halo Top or Enlightened. What I like best about these is that they have the same creaminess of a traditional ice cream, whereas Halo Top or other lower carb ice creams always taste more icy to me than creamy. Jon said he only wants to eat these from now on. 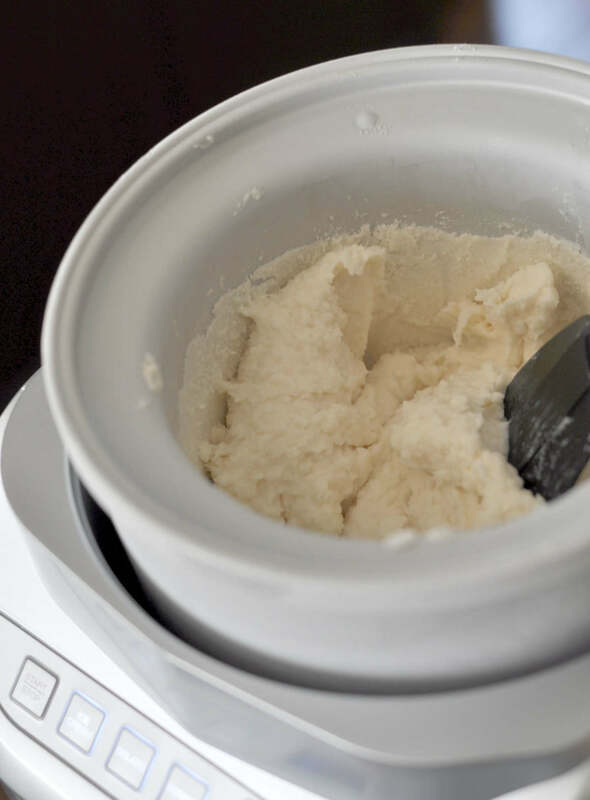 Plus, now that I have my ice cream maker, I can make all sorts of different low carb frozen treats. My favorite topping is chocolate! This ice cream looks great! I make a coconut sugar caramel that would be great on it! ????
. I would put it all over this ???? I’d love to top the ice cream with some crumbed bacon! Yum! Hot fudge and warmed peanut butter sauce with chopped dark chocolate 90% and chopped almonds. I love LCFoods. Love their freeze dried cheese in their snack packs. Almonds and Blueberries on vanilla-flavored ice cream ???? Looks so good, I would definitely add some homemade whipped cream on top. Ice cream forever! Yes! Fabulous idea. And low carb fresh whipped cream is so easy to make! Yummy!!! I love chocolate chips/chunks on & in my ice cream! Omg where do I even start… I probably would add some chocolate chips (I love a crunch in my Ice cream) to some vanilla ice cream, some chocolate sauce and some strawberries. Hi there Love your blog. I would have to say sugar free chocolate chunks and cherries. So good together. I would love to try them all! Yum! I would love to make this and top it with whipped cream, a little bit of banana, and slivered almond. Chocolate and whipped cream, LC. I love everything you do!! I would like the chocolate sauce. Pretty traditional!! I’d have to go for chocolate and some nuts! Yum! Any of the preserves and dark chocolate chips! So excited to show my husband! 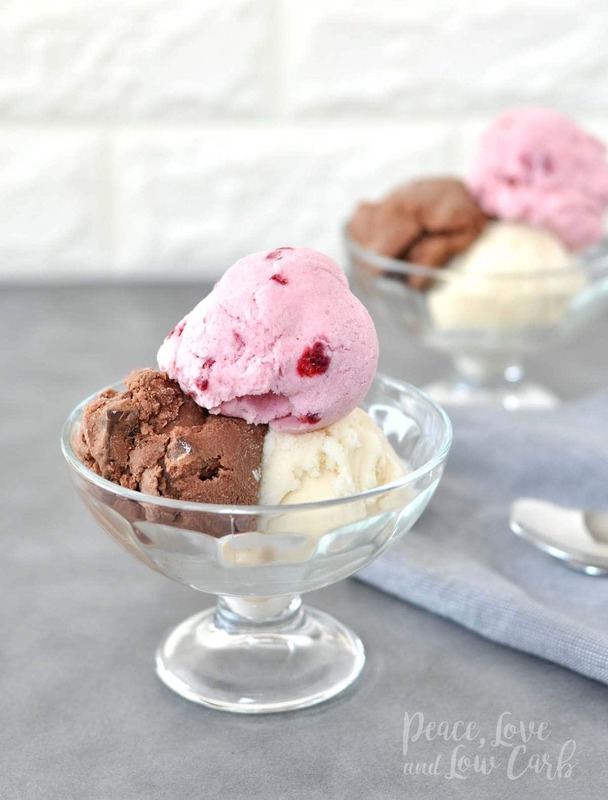 One of my favorite non-keto ice cream dishes was dark chocolate ice cream with almonds and raspberries. When I saw that ice cream mix, and saw the chocolate almond raspberries snack mix, I was elated. I would love to be able to eat ice cream again! I originally started Keto because of a brain tumor in my pituitary gland, but it has honestly changed my life for the best! Thank you for all the help and delicious recipes. Would love to give this ice cream a try! Whipped heavy cream & chocolate!!! I think from LC foods I’d add the brownie all crumbled up and maybe the banana bread. I would top with chocolate and sliced almonds…. I had despaired of ever having a real dessert again, and then this was posted. Sigh. My favorite topping is chocolate sprinkles – not sure if those come in low/no-carb, though. Peanut butter sauce and whipped cream! A little sprinkle of nuts would be awesome too! The toppings I would put on my sundae if I win are hot fudge, caramel sauce, whipped cream, nuts, sprinkles, and a cherry or two. My ice cream toppings would be strawberry preserves with the granola mix with chocolate chips and almonds. Yum yum!! I’d put on some sugar free dark chocolate chips. I would put the chocolate almond raspberry from the snack packs with some crumbled bacon on top of mine!! Sweet and salty…oh yeah!!!! 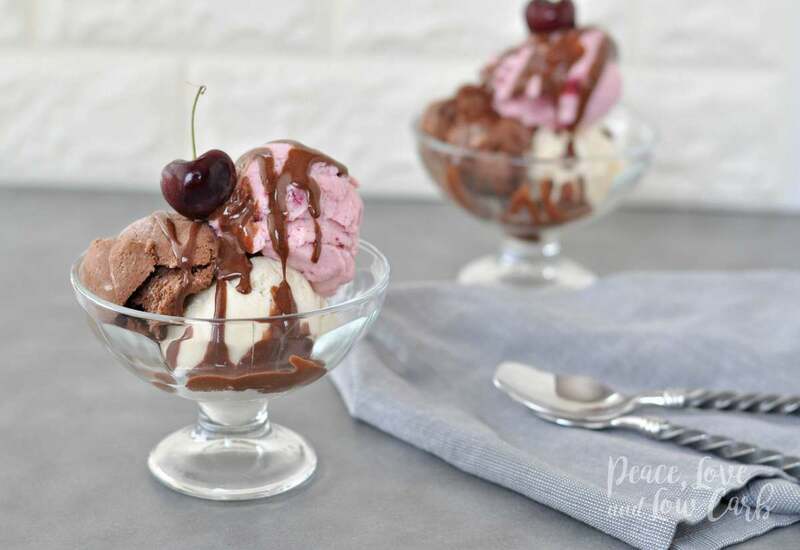 Low carb chocolate sauce would taste lovely in any of the flavors of ice cream. Peanut butter and whipped cream!!! I would put chocolate and coconut chips on my ice cream. Warm almond butter and bacon!!! I would put Sugar Free Dark Chocolate Chips and Toasted Coconut on it. Would love to try this Ice Cream Maker! I’ve been curious about their ice cream mixes. If I win, I’ll make the vanilla first and top it with strawberries. The chocolate and strawberry would be topped with homemade magic shell. Yum! Like my ice cream with lots of goodies mixed in it. Chocolate chunks or peanut butter gobs! The No Sugar Added Blackberry Preserves would be so yummy on Vanilla or custard.